On Thursday, February 2nd, I attended an event at Juicy Couture's Madison Avenue location to celebrate the launch of the D.I.Y. Charm Collection. Guests enjoyed cocktails, while meeting with renowned astrologer Susan Miller. You can create the perfect gift with the D.I.Y. Charm Collection, just in time for Valentine's Day. Choose from a necklace (includes iconic Juicy heart), $42 or bracelet (includes logo charm), $42 and customize it by adding on charms such as a wishbone, bow, heart, lightning bolt, sparrow or initials. I opted for the chain necklace and added my initial, "k" to it. The lightning bolt is next on my list! The charms range from $28-$38 each. The collection is now available at Juicy Couture stores and online at juicycouture.com. Gela Nash-Taylor and Pamela Skaist-Levy founded Juicy Couture, which is now owned by Liz Claiborne. This high-end fashion company sells apparel and accessories that include a line of jewelry charms for bracelets. 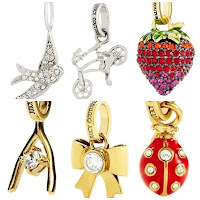 The charms are available in a variety of unusual designs, from the surfboard charm to the pink princess carriage charm. Each charm is accented with gold or silver and juicy couture handbags rhinestones. The lobster clasp on each charm simplifies the process of adding it to a chain bracelet.